Ah, Australia Day. 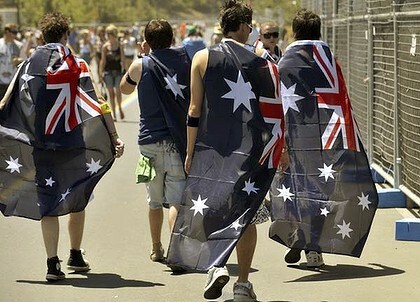 The day when we all release our inner bogans, with Australian flag temporary tattoos, board shorts, and top hats. The day when we all adopt the worst fashion sense possible in the name of being Australian. The day of the great bbq, as there is rarely a household currently enjoying a sausage on the bbq and the taste of an alcoholic beverage. The day of the annual Triple J Hottest 100, a count down of the greatest music released during the previous year (for good reason, crap pop music is exempt from this list). Currently I'm waiting for some washing to finish, then will be heading to the bottle shop to collect another bottle of liquor, the service station to fetch some ice, then to my friend's house to partake in my own frivolity. I may end up looking like the female equivalent of this. I have begged Mario to go kitesurfing with his friends, namely because it's his passion. They're doing a downwinder, meaning they'll start at one place and travel downwind to another location. The overall process takes a few hours. He initially wanted us to spend the whole day together, but I didn't think it would be fair to get him to join my friends and I to listen to music he doesn't like, while his friends are out doing one of his favourite hobbies. Instead, he will join me later after the kitesurfing session, right on cue for when the count down in the hottest 100 will be reaching a point where he might know the odd song or two. I really need to teach that boy good taste. I hope all Australians are having a wonderful day, and for those abroad, just have a beer for us. It's a day to be proud of our bogan heritage.